Not everything matters. Life is short. Live accordingly. With these two truths and one principle, fifty-something Rob Bialostocki suggests that what counts is that we live a life, and do work, that really matters. Everything else will, in the end, no matter very much. Rob is a successful radio broadcaster and has been a corporate consultant and coach since 1997. He coaches professionals in communication and leadership, speaks at conferences and runs training workshops. But his true passion is inspiring and helping people to find clarity and wisdom. He runs a podcast called Living a Life That Matters. In his debut book, he discusses why our modern lifestyles mean that for many between the ages of 35 and 55, life becomes overly busy, distracting, tiring and overloading. We're in danger of living on autopilot, following someone else's ideals, and leaving many of our hopes and plans on the back-burner. We're too distracted and tired to do anything else. 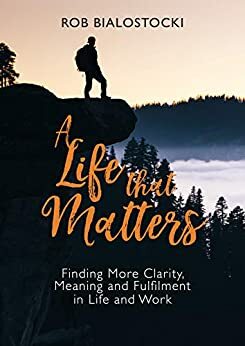 Rob suggests a three-step pathway to living a life that matters that includes gaining clarity on what's important and why, simplifying your time and commitments, and finding or creating purpose to what you do, why and how. With personal stories, inspiring quotes and practical ideas, Rob hopes that this book will help you get some of what you're looking for. Because more of the same just won't cut it any longer.